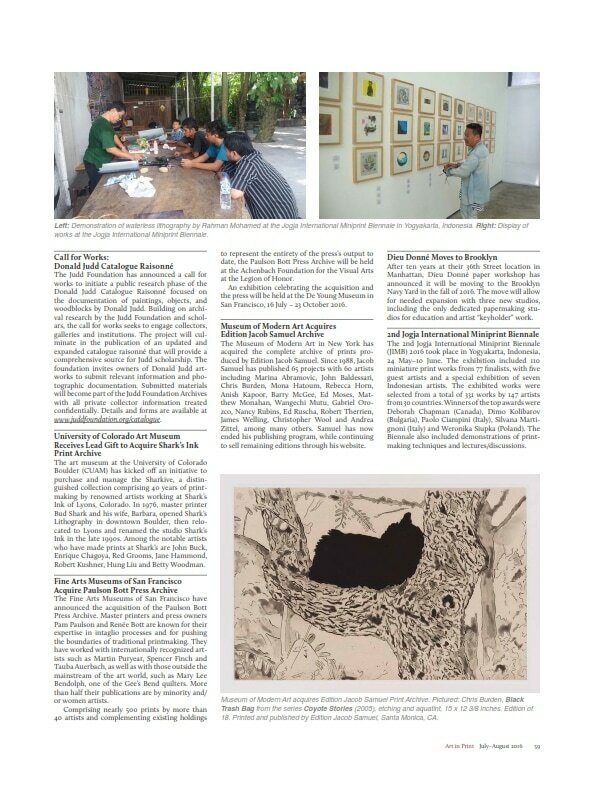 One of the highlights of Jogja Art Weeks, a month-long plethora of events held during June in Yogyakarta was the 2nd Jogja International Miniprint Biennale (JIMB#2). Emphasizing the exceptional skill of participating artists working in an array of print making mediums, the biennale was on display 24 May – 10 June at Sangkring Art Project. In an era where new media and media exploration are often praised as the demigods of ‘art now’, conventional art forms such as printmaking are often overshadowed. The travelling exhibition, held also at Bentara Budaya Solo 1-7 September, recently ran from 20-28 October at Galeri Soemardja, Bandung. “Art can be now made with the help of artisans, machines, or other objects and intermediaries. In the current art environment the artist’s hands are no longer considered significant in carrying on the struggles of the soul,” said artist, gallerist and JIMB#2 Jury Chairman Agung Kurniawan.